Ex-inmates in Latvia’s concentration camp at Salaspils, where thousands died, including children, are appalled at the resurgence of far-right nationalism. While Riga prefers to turn a blind eye to the atrocities, witnesses share their stories with RT. “We were brought to Salaspils in July 1944. I still can't believe we were able to survive this hell,” says Zinaida Semyonova, a former prisoner in Salaspils. She recalls that there was a children's barrack where most of the kids, aged from seven to 10 years old, were held, separated from their parents. Children were given special badges with their names and some information on them. They would play with them, exchange them. As a result some of them would lose their names. “The kids were rotting alive. They were crying, especially the little ones, screaming, losing consciousness. They would take the smallest ones while they were still alive, still moving, crying, while they still have strength to cry. There was a special cart on wheels. They would throw them out of the gate. There were ditches outside...” Semyonova told RT. Established at the end of 1941 in a picturesque pine forest southeast of Riga, Salaspils was officially a Police Prison and Work Education Camp, in an area measuring about 600 by 400 meters. Remembering those “malpractices” still gives Semyonova the shivers. Another Salaspils survivor, Evgeniya Loginova, was 9 when she was taken to the camp. Her two brothers were murdered there. 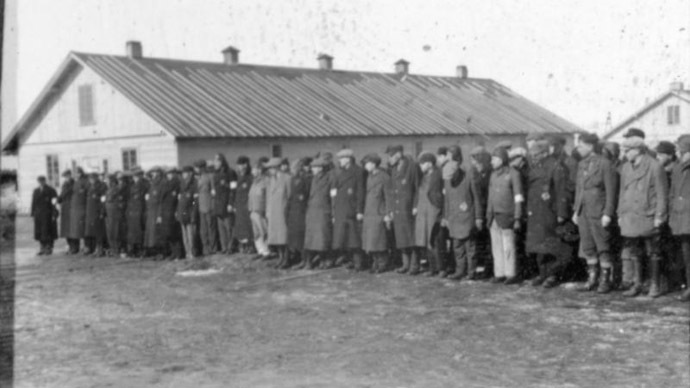 About 12,000 prisoners went through the Salapsils camp. In addition to the German Jews who died during the construction phase, about 2,000 to 3,000 people perished due to overwork and disease. But according to a former Latvian Waffen SS fighter, Visvaldis Lācis, who is the only one of the Latvian soldiers still alive, “there was no death camp” in Salapsils. At least 632 corpses of kids from three to nine years old were found near the former camp in different graves, historian Gusev says. That's just one-fifth of the camp’s area. Meanwhile former camp prisoners say they are alarmed by Nazi Waffen-SS veterans and their supporters who hold annual marches in Riga. Up to a thousand marched through Latvia’s capital in their annual commemorating procession in mid-March. “They organise all these marches now, the same SS officers from the camps. They tortured us there, stood there with machine guns. Now they march along the central streets,” Zinaida Velika told RT. Russia says the Nazi veterans’ march is a violation of international law. Anti-fascist and Jewish organizations, such as the Simon Wiesenthal Center, believe such rallies glorify Nazism.